Bull. Mus. Hist. Nat. (Paris) v. 308. 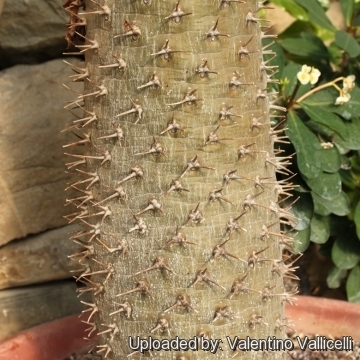 Pachypodium lamerei var. fiherense n.n. Pachypodium lamerei subs. fiherense n.n. Pachypodium lamerei f. monstruosum hort. Pachypodium lamerei f. compacta hort. Pachypodium lamerei f. cristatum hort. Pachypodium lamerei f. inermis hort. 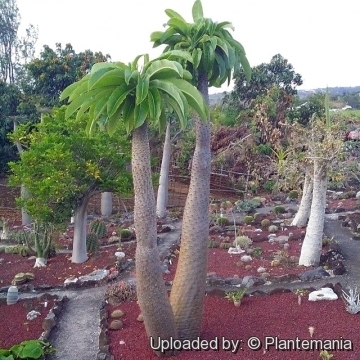 Description: Pachypodium lamerei is a very attractive spiny semidecidous or deciduous semitropical succulent stemmed tree, 2,5-6 m tall, or more with optimal conditions. 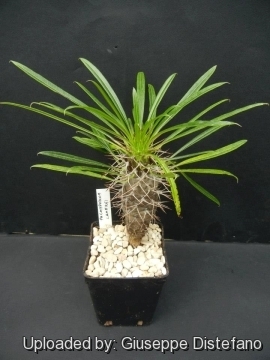 (As a houseplant, it is much smaller) In cultivation it is often marketed as the "Madagascar Palm", despite in not being a palm at all. 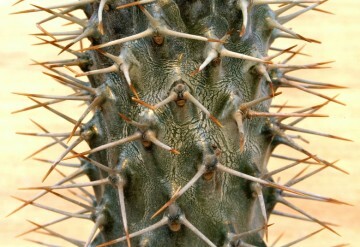 The Pachypodium tends to lose its leave and go dormant in winter in temperate climate areas. Stem: It has a an intensely spiny grey (almost white) and stout trunk with smooth surface, which is solitary and columnar when young or dichotomously branched when older and the base is spindle-shaped or bulbous. The trunk can grow up to 30 centimetres in diameter and five meters height and is covered by tough, glossy bark and spirally set low tubercles. Branching starts only after the first flowering which can be expected once the plants are about 1,5-1,8 m tall. Thorn: 3 on each tubercle, the 2 divergent lateral 1-2,5(-6) cm long, with a shorter ascending central. Roots: Fine, delicate (older plants can have huge rootballs, though). Inflorescence: Terminal with stout branching peduncle 5-20 cm long. Flowers: The flowers are 3-6 cm long and 5-8(-11) cm in diameter, salverform, white with yellow centre, attractive and nice smelling. Corolla lobes truncate, abruptly narrowed toward the base 2,5-4 cm long. It rarely flowers indoors. 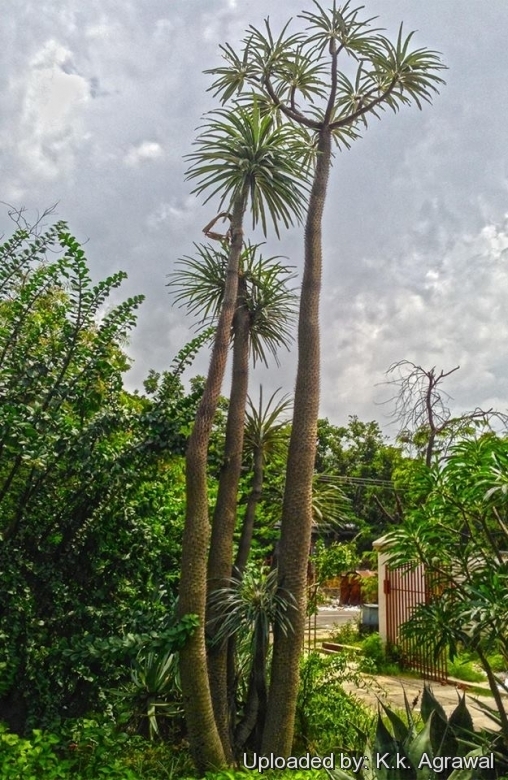 Blooming season: Only mature plants bloom (1,8 m tall or more). It flowers in spring to early summer, on and off through all the warm months. Fruits and seeds: It produces seed pods that look like bananas. 15-20 cm long. Left alone, they eventually open along the seam revealing great numbers of white-winged seeds. Seeds: Simple, green, finely tomentose below, lanceloted arranged spirally mostly just at the top of the plant. Flowers: 15 mm long, brown. Pachypodium lamerei Drake: Semidecidous or deciduous semitropical succulent tree, up to 2,5(-5) m tall. Trunk solitary or scarcely branched. Leaves finely tomentose below. Corolla lobes truncate 2,5-4 cm long. Distibution: Madagascar. Pachypodium lamerei f. compacta hort. : This is a rare compact growing mutation that occurs only over thousand seedlings. Cultivated form. Pachypodium lamerei f. cristatum hort. : Form convoluted fan-shaped or snaky ridged cluster. The comb-shaped foliage is arranged only at the top of the trunk . Pachypodium lamerei var. fiherense n.n. : remains small and flowers at a young age. Distribution: Atsimo, eastern Toliara. Pachypodium lamerei f. inermis hort. : This is a pretty attractive unusual form with a thick thorn-less grey trunk. 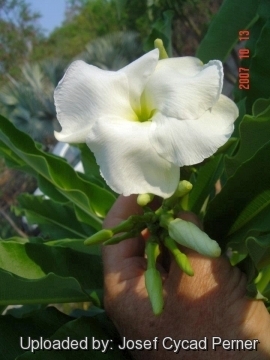 Pachypodium lamerei var. ramosum (Costantin & Bois) Pichon: has a dwarf growth habit, rounded corolla lobes 4-5 cm long. Leaves glabrous (not tomentose below). Distribution: South Madagascar. Pachypodium menabeum Leandri: has smaller bottle shaped succulent trunk with candelabra-like branches 2-5 m high. Style hairless. Leaves are glabrous on both sides. Distribution: tsingy of Bemaraha. Central Madagascar. 6) Haude, M. Pachypodium Lindl. 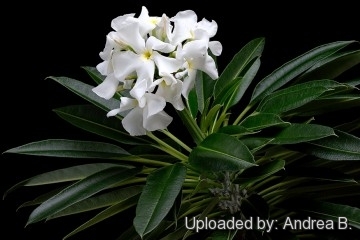 - familie Apocynaceae. Kakteen And. Sukk. 22(4): 122–127.1987. 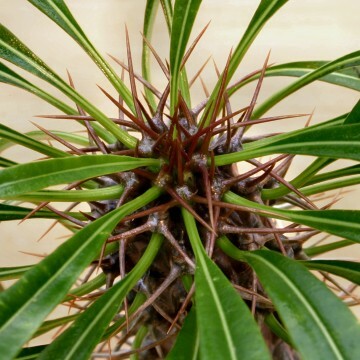 8) Perrier de la Bathie, H. Les Pachypodium de Madagascar. Bull. Soc. Bot. France 81: 297–318. 1934. 9) Pichon, M. Classification des Apocynacées. Mém. Inst. Sci. Madagascar, Sér. B, Biol. Vég. 2(1): 45–140.1949. 10)Schatz, G. E., S. Andriambololonera, Andrianarivelo, M. W. Callmander, Faranirina, P. P. Lowry, P. B. Phillipson, Rabarimanarivo, J. I. Raharilala, Rajaonary, Rakotonirina, R. H. Ramananjanahary, B. Ramandimbisoa, A. Randrianasolo, N. Ravololomanana, Z.S. Rogers, C.M. Taylor & G. A. Wahlert. 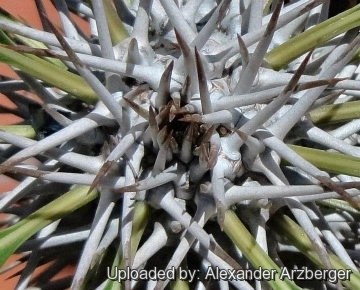 Catalogue of the Vascular Plants of Madagascar. Monogr. Syst. Bot. Missouri Bot. Gard. 2011. (Madagascar Palm) This pretty and attractive plant with a thick thorny grey trunk is not a palm. Photo by: Andrea B.
Cultivation and Propagation: Pachypodium lamerii is fairly easy to grow both indoors, as well as outdoors in warm climates and can grow at about 10cm a year. In the winters it is deciduous, except in very tropical areas. Growth rate: It is a fairly slow growing plant, but in 10 years it can easily outgrow its indoor location, requiring a 'pruning'. Though branching is usually a response to naturaly injury, or something that happens in older specimens, one can stimulate branching by cutting off its top. It has amazing regenerative properties. Repoting: Repot the plant every 3 years; this is quite tricky given all the spines. The best way is to wrap several layers of newspaper around the trunk where it is to be handled. Waterings: It needs regular water when the plant has leaves, contrary to popular belief, it likes a lot of water in the warm summers, as long as it's planted in a very well draining soil. Indoors it is best to err on the dry side, or it is prone to rot. Propagation: Seeds or division.Fresh seeds results in a remarkable yield of new plants, perhaps 90%, Soak seeds in warm water for 24 hours before sowing in moist sand. Seed start sprouting in just 3-4 days ( but continue to germinate erratically for about 6 month). Pachypodium lamerei are also propagated by removal of small offshoots that grow at the base of the old plant. Carefully break off the offshoots, they should be allowed to dry for 5 to 8 days before potting up.